Diplocaulus was an aquatic amphibian that grew up to 3 feet (0.9 meter) in length. Unlike most other reptiles and amphibians of the time, Diplocaulus was completely adapted to a water environment. They had tiny legs of little use, a boomerang shaped head and a long slender body. They also possessed a long, powerful tail that propelled them through the water, while the broad, flat head may have acted to guide the animal. The location of the eyes and nostrils on the surface of the skull suggest that this animal may have quietly laid on the bottom of pools or rivers waiting for food to get close. 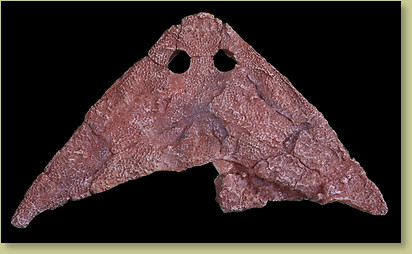 Diplocaulus probably fed on crustaceans, insects, and possibly carrion. Our cast is from a nearly complete original skull with lower jaws - one of the finest skulls we know of. Available as an unpainted cast suitable for some research or reference purposes. Note: some portions of the original fossil may have been scientifically restored. Notes Photo represents what this cast may look like if finished for display. Custom painting is available upon request, for an additional fee. Please contact us with your questions.